The following article appears in The Popular Encyclopedia, published by Blackie & Son, 1883. His fame as a preacher had by this time extended itself throughout Scotland, and a vacancy having occurred in the Tron Church of Glasgow, he was elected to the charge by a large majority of the town-council, and inducted on 21st July, 1815. In the month of November following he commenced his series of astronomical discourses, in accordance with a custom observed in Glasgow, of the city ministers delivering in rotation a course of sermons in the Tron Church on Thursdays. The effect of these was perfectly electrifying, and created a sensation such as no sermons had ever before produced in Glasgow. It is related, that when the hour of delivering them arrived, merchants and men of business would regularly leave their desks and proceed to the Tron Church, while the more liberal among them would, in addition, grant a similar indulgence to their clerks and assistants. In the commencement of 1817 these discourses were published, and attained a sale of nearly 20,000 copies by the end of the year. They raised their author to the position of the first preacher of the day, and in a visit which he shortly afterwards paid to London, the most distinguished literati and statesmen crowded to listen to the wondrous oratory of the Scottish divine. The main object which engaged Dr. Chalmers on his arrival in Glasgow, was the reorganizing of the parochial system, so as to provide a machinery by which the destitute and outcast might be visited and reclaimed, and the young instructed in the lessons and duties of religion. With this view he allocated to each of his elders the part which they should respectively bear in carrying out this new scheme, and succeeded in infusing into them the same ardent active spirit by which he himself was animated. Especial efforts were directed towards the establishment of Sabbath-schools, which in the course of two years had an attendance of 1200 children. 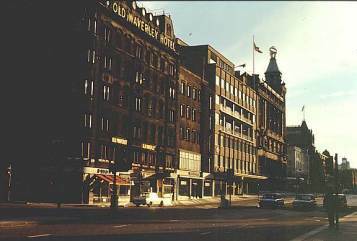 Great exertions were also made by Dr. Chalmers to get new churches erected throughout Glasgow, the church accommodation for which comprehended scarcely a third of the inhabitants. In this he ultimately succeeded, and in addition, a new parish and church (St. John's) were erected and endowed expressly for himself by the town-council of Glasgow. To this he was in 1819 transferred from the Tron. The same zeal and activity which had there marked his pastoral career, were displayed in the conduct of his new parish. Besides numerous Sabbath- schools, two large week-day schools, in which all the primary branches of education were taught at a low rate, were established on behalf of the parishioners of St. John's. The fatigues, however, which such unremitting attention to parochial affairs involved were becoming too much for his health, and he had now so far adjusted matters in his parish, that the management of the machine might be intrusted to others. career in one city or another. Mainly Glasgow. 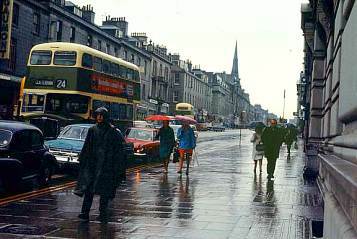 Edinburgh - Princes Street in 1978. Chalmers was here quite a lot of his life. On the vacant chair, therefore, of moral philosophy, in the University of St. Andrews, being offered to him, he accepted it, though, as might have been expected, a considerable disappointment was thereby produced in Glasgow. The date of his transfer to St. Andrews was November, 1823. As an instructor of youth, his affectionate concern for their welfare, independent of the mere intellectual attractions of his lectures, made him universally beloved by the students, many of whom he used to assemble at his house on Sunday evenings, for the purpose of religious conversation and instruction. In the town of St. Andrews, likewise, he laboured assiduously in visiting the humbler classes, and promoting their religious and moral improvement. In 1827 the divinity chair in the University of Edinburgh became vacant by the resignation of Dr. Ritchie, and Dr. Chalmers was unanimously elected to it by the town-council on 31st October. This appointment he continued to hold till the Disruption from the Scottish church in 1843. In 1832 he published his Political Economy, and shortly afterwards appeared his contribution to the celebrated Bridgewater Treatises, On the Adaptation of External Nature to the Moral and Intellectual Constitution of Man. In 1834 he was elected a corresponding member of the Royal Institute of France; and the following year, while on a visit to Oxford, had the degree of Doctor of Laws conferred on him by its university. An important matter which now largely engaged his attention was the subject of church extension, which he had zealously advocated from the days of his ministry in Glasgow. But Lord Melbourne's government was little disposed to aid the Church of Scotland on this occasion, and it was consequently obliged to carry out its scheme on the voluntary principle. The results were satisfactory, and in 1838 Dr. Chalmers was enabled to state to the General Assembly, that within the last four years there had been collected about £200,000, out of which nearly 200 new churches had been built. Amid the various public movements with which Dr. Chalmers name stands connected, there is none in which it more prominently occurs than in relation to the great non-intrusion movement in the Scottish church. Throughout the whole of this memorable contest, from the passing of the veto law by the General Assembly to the Disruption in 1843, he acted as the leader of the Evangelical party in their struggles with the civil power, and may be regarded as the founder of the Free Church, of the first assembly of which he was moderator. (The second was Robert Candlish) He was also the originator of the sustentation fund, out of which the ministers of that body are principally supported. Having vacated at the Disruption his professorial chair in the Edinburgh University, he was appointed, on the establishment of a new college in connection with the Free Church, to the offices of principal and primarius professor of divinity in that institution. Towards the end of 1844 he set on foot a scheme for reclaiming the inhabitants of the West Port district in Edinburgh, a locality notorious alike for physical squalor and moral degradation. A staff of visitors was organized for the purpose of visiting the different families in this quarter; a school was opened in the close which had earned an unenvied fame as the scene of Burke and Hare's murders; and lastly, an old tannery loft was opened for worship on Sundays, Dr. Chalmers himself conducting the services. Ultimately a territorial church was erected in the West Port, and opened on 19th February, 1847. This movement was about the last public work in which Dr. Chalmers engaged. On 28th May of last-mentioned year he returned to his house at Morningside, near Edinburgh, from a journey to London on the subject of national education. On the following day (Saturday) he was busily employed in preparing a report to the General Assembly of the Free Church, then sitting. On Sunday, the 30th, he continued in his usual health and spirits, and retired to rest with the intention of rising at an early hour to finish his report. The next morning he did not make his appearance, and no answer being returned on knocking, his room was entered, and he was discovered lying tranquilly in bed quite dead. He had evidently passed away in a moment, without pain or even consciousness. He was interred in the Grange Cemetery, whither an immense assemblage of persons of all denominations accompanied his remains to the grave. The energy which made Chalmers remarkable as an orator was infused into all his practical undertakings; and in the social and religious movements which he inaugurated he has left his mark in the history of his country. His published works are very numerous, embracing sermons, tracts, essays, works on Political Economy, the Parochial System, Church Establishments, &c. They exhibit the same energy of conviction, together with a breadth and profundity of view, which, though many of his theories have not been accepted by other thinkers, will always make them a rich mine of suggestion and instruction to inquirers into the complicated relations of human society. Of his posthumous works, published by his son-in-law and biographer, Dr. Hanna, his Daily Scripture Readings and Sabbath Scripture Readings, the latter especially, are valued for their devotional feeling. Note that the visiting in the West Port district was not the first project of this sort. See Andrew Bonar's Diary for 25th Dec.1831, and the quotation from R.M.M'Cheyne's diary which AAB gives in his Life of RMM at 3rd March 1834. Also the preceding paragraph. 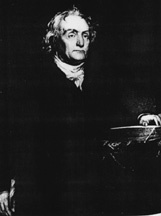 An account of the funeral of Thomas Chalmers can be found here..
OPINION - Posterity seems to regard Thomas Chalmers as a magnificent failure! All the things he fought for, argued for, wrote for, and innovated seem to have failed. Not one book by him, or even about him, is currently in print. So is this a just decision? To my mind it is not. Judged by those standards all the Judges of the Old Testament would be accounted failures, as would also our Lord! No, "God sees not as man sees, but lookest upon the heart" and success must surely be measured by whather the fight was fought diligently, properly and in a God-fearing manner, not by its worldly success. What shines out brightly from his journal and letters is the aching heart he had for bringing souls to the Lord. All the so-called worldly objectives, such as amendment of the Poor Laws, and Church and College Extention were aimed at one and the same target - winning souls for the Lord. His mighty brain saw clearly what some of us see but dimly, and others not at all - that if all be done to God's glory, and in submission to Holy Scripture, other "secular" matters will come right.